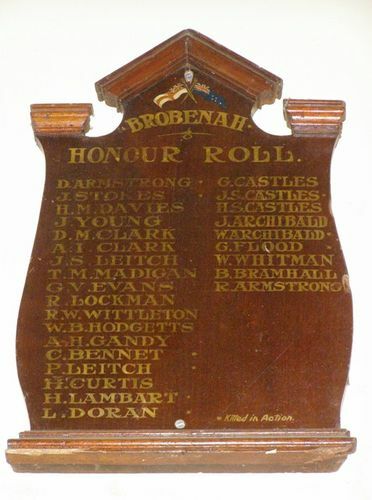 Brobenah Honour Roll commemorates those who served in World War One. The unveiling of the war trophy allotted to Brobenah and the honor roll took place at the Brobenah Hall on Wednesday evening last, when there was a crowded house. Cr. G. Gow occupied the chair. Several artists from Narandera assisted at the concert which was successful. The Chairman explained the reason for the gathering, and asked Messrs. Leitch and Jackson to unveil the honor roll and the machine gun by drawing aside the Union Jack and the Australian flag which hid them from view. The whole audience stood in respectful silence while this ceremony was performed.